Farmers have increasingly shifted away from conventional tillage to some form of reduced tillage. In part, this reflects efforts to control labor, fuel, and maintenance costs as well as the recognition that tillage can contribute to a decrease in overall soil health. Tillage accelerates the breakdown of soil organic matter, makes soil more susceptible to erosion, and may create a plow pan or compaction layer. Zone tillage, also called zone building or strip-till, is one form of reduced tillage that is essentially a compromise between conventional tillage and a no-till system. This factsheet provides an overview of the benefits of zone tillage as well as some potential challenges. Figure 1: A zone builder creates a 6-10 inch wide planting strip while leaving all other soil undisturbed. The implement that is used to perform zone tillage is known as a zone builder, or strip-till rig (Figures 1 and 2). Typically, a zone builder creates a 6-10 inch wide planting strip while leaving all other soil undisturbed. Row spacing may be adjusted for different crops and planting methods. All zone builders typically have the same set of core components: cutting coulters, deep shanks, hilling coulters, and rolling baskets. * Cutting coulter: cut through crop residue, break up clods, push rocks out of the seedbed. * Deep shank: till soil in a narrow strip and can break up subsoil compaction layers depending on depth of placement and depth of the compaction zone. The shank may operate up to 20 inches deep (depth is typically set no deeper than necessary to penetrate a plow pan or compaction layer). * Hilling coulters: hill the soil over the area tilled by the shank to limit moisture loss. * Rolling basket: break up soil clods and create a proper seedbed. Figure 2: Zone builders typically have the same set of core components: cutting coulters, deep shanks, hilling coulters, and rolling baskets. Organic matter: Soil organic matter is important for soil water management, nutrient availability, retention, and cycling, and soil aggregation (soil structure). Disturbing and aerating the entire plow layer and incorporating all surface residues can result in decreasing organic matter level over time as decomposition of the organic matter is quicker in disturbed soil. In a reduced tillage system, the majority of soil is undisturbed allowing for soil organic matter buildup and this will improve soil structure over time. 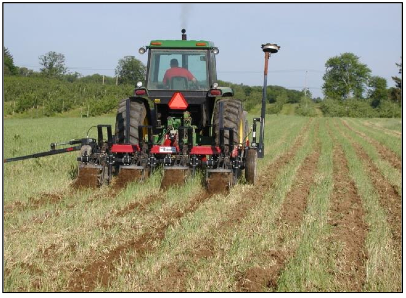 Compaction: Many agricultural soils are susceptible to soil compaction, which can lead to restricted root penetration, poor drainage, and reduced yields. 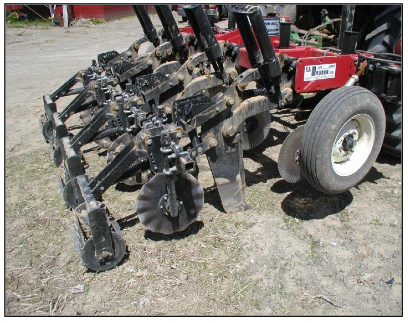 When deep shanks are used, compaction can be managed without full-width tillage. The slot made by the shank gives roots an easier path deeper into the soil profile (Figure 3). This helps during dry conditions because the plant is able to reach additional water that is further down. During wet conditions water is able to drain easily instead of potentially drowning the plants. Figure 3: Zone till can help plants develop a deeper rooting system. 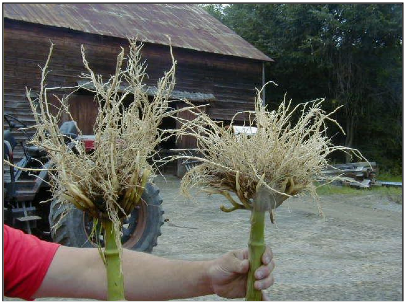 Sample on left was grown using zone tillage while the other, a conventional tillage system. Farm economics: Another benefit of zone tillage is reduced cost of tillage as compared to conventional tillage. Only one pass is required with zone tillage, while some conventional tillage systems may require multiple passes. In addition, deep zone-tillage might only be needed in some years in the rotation. Farm economics: Although operating costs for zone tillage are lower than for full-width tillage, it still requires the purchase of a zone builder or the hiring of a custom operator. Zone building will also result in higher equipment, fuel and labor costs than costs for a no-till system. Weed and residue management: Managing weeds can be more challenging because only a portion of the field is tilled. Perennial weeds could become more of an issue resulting in the need for increased herbicide use. In addition, excessive surface residue can be challenging for some planting equipment and may require careful attention to detail by operators. Field conditions: Hilly fields can be particularly challenging for zone tillage. Hills may cause the zones to shift location slightly, especially when tillage is performed in the fall. This then makes it difficult to be precise when planting in the zones, as a global positioning system (GPS) cannot compensate for this drift. Correct soil moisture is also required in order for the shanks to actually till the soil as intended instead of just slicing through it like a knife through butter. Tilling too wet can smear the sides of the zone and create vertical compaction layers that limit root growth. Zone tillage in rocky soils can result in damage to the different components of the machine so maintenance costs for use of a zone builder in rocky ground can be high. Zone and strip-till tillage has become popular with many farmers. New York growers typically find it easier to implement these systems than to switch to a no-till system. Zone and strip-till are useful practices that can help improve soil health over time, while reducing tillage cost compared to conventional full-width tillage.